Theatre Eddys: "It's Only a Play"
“The party of the year for the play of the century” is getting louder and louder on the floor below, with celebrities galore in attendance for the opening night’s post-play celebration (Al Pacino, Rosie O’Donnell, Barack Obama, the Pope -- just to name-drop a few). The casts of The Lion King, Aladdin, and Hamilton are arriving (although the Hamilton troupe has just left for a better offer). The snowball-tossing Matilda cast of kids is busy breaking windows outside in the midst of a New York-style blizzard while a small gathering anxiously awaits in the upstairs, Art-Deco-era hotel suite for the New York Times critical verdict of tonight’s much-anticipated premiere. That the play’s title is The Golden Egg should be clue enough that a death sentence is going to be the judgment by the theatrical oft-executioner, Ben Brantley; but in the meantime, hope springs eternal as Broadway gutter-worthy gossip fills the air. It’s Only a Play has had its own troubled past since its original version in 1978 as Broadway, Broadway. Attempts to get to the Great White Way met roadblocks by none other than bad reviews. Short stints on off-off-Broadway (1982) and off-Broadway (1985) with many re-writes along the way finally led to an extended and successful run on Broadway in 2015. With the likes of Nathan Lane, Stockard Channing, and Mathew Broderick in the starring roles, this was a production I fortunately saw and almost fainted from laughing so much. Now with even more updates to the script in order to ensure there are plenty of current famous names and show titles to slip into every other spoken line, Terrence McNally’s over-the-top, comedic play about plays lands with full aplomb and much hilarity on the San Francisco stage he most often frequents -- this being the thirteenth time – the New Conservatory Theatre Center. Mr. McNally has populated this stage with every stock character one might associate with a parody on play writing and play producing. There is the one-play, boy-wonder playwright, Peter Austin, whom everyone is waiting like sharks with their chopping bits to see if he can repeat his first hit. His best friend, James Wicker (or is it Wacker, as everyone keeps calling him?) is presently a TV actor who turned down the play’s lead role (and secretly hopes for a flop to prove himself right for doing so). The wrinkled-with-age lead lady, Virginia Noyes, is a line-forgetting, cocaine-snorting actress whom everyone still treats to her face as the Broadway royalty she once was -- while also trying to ignore politely the clumsy ankle monitor a court’s judge has ordered to be placed on her. Sir Frank Finger is a director whose avant-garde (actually ridiculous) choices keep winning him accolades, even from critics -- so much so that his deepest wish is for a failure. “I need a flop; I want a flop,” he (very) dramatically cries. Julia Budder is the richer-than-God producer who loves to quote famous stage lines but is always screwing up one critical word (”If I can make it here, I can make it there”). Ira Drew is a small-time theatre critic who is acting like he should be feared as if big time and who is secretly writing plays that never see the light of day. And finally, there is the wanna-be actor, Gus, whose job tonight is to bring the coats of party guests upstairs for safe keeping and who is just looking for the chance to belt out a song from Wicked in the hopes of being discovered. With such a group as his scripted fodder, New Conservatory’s director, Arturo Catricala, has much potential for fun and frivolity, given the right cast. Fortunately, he struck gold in finding this ensemble, as each person cast in the above roles plays the part to the hilt. Under his well-timed, meticulously blocked direction, none misses an opportunity to garner another chuckle or full-out guffaw through the delicious diatribes and digs they get to throw in each other’s direction. With full force, they all also blast alcohol-induced insults and insinuations to all the unseen famous whose names they so like to drop at every chance given (and Terrence McNally gives them plenty of chances). All the rest of this cast measures up to the task of producing much merriment in a situation that is increasingly full of angst and agony for their characters awaiting what we all know is bound to be bad news. Melissa Keith is out-to-lunch as the ever-optimistic, carefree producer Julia Budder, not realizing how ridiculous she is in always misquoting lines and really not caring if she loses millions of her husband’s fortune – as long as she gets to mingle with the B’Way crowd and the cute director whom she adores. That director (Sir Finger) is played with pompous airs and a tendency to over-dramatize everything by Kevin Singer, who particularly thrives in flinging himself in side-splitting, suicidal dives onto a bed full of coats and muffs. The role of critic and secret playwright is Geoffrey Colton’s to portray, as his Ira Drew thrives on being cynical with a voice that has edge enough to cut down to size any actor or director not currently present but a voice that melts in a solicitous puddle when he thinks there is a chance his play (The Blue Stocking) might have found a route to production. And not to be over-looked amongst all the theatrics of these theatre folks, Nicholas Decker is the coat-wagging, actor-in-the-making Gus P. Head. Outwardly, he is a gosh-darn, wide-eyed guy from the farm who somehow happens to know a helluva lot of theatre trivia. On closer observation, this is a guy with calculative gleams in those same eyes, ever waiting in the wings to audition his talents in front of this group of so-called theatre luminaries. 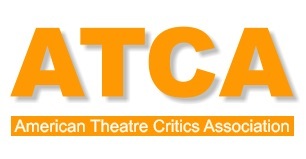 The creative team that Director Catricala has assembled plays a starring role equal to the actors themselves in making NCTC’s It’s Only a Play a hit. Kuo-Hao Lo’s set is rich in detail and looks like a Times Square hotel suite that is befitting a star-filled, New York gathering. The props of Christopher Daroca provide many fun touches, including the doggy treats in silver bowl that keep being the snacks of the hungry, unsuspecting people gathered. That dog’s vicious growls behind a side room’s door is just one of many excellent sound effects created by James Ard while the luxurious lighting of Christian Mejia underscores further the decision by The Golden Egg’s producer to spare no expenses in this upscale setting for the night’s hoped-for, victory party. 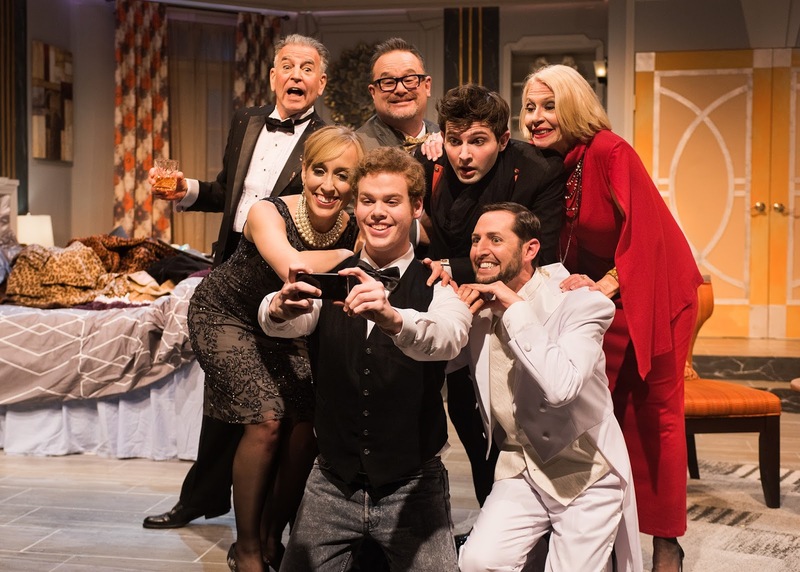 And of course Costume Designer extraordinaire Keri Fitch has insured that the evening wear of each of these quirky characters leaves no doubt as to their individual eccentricities. 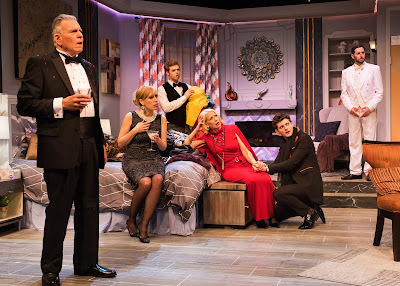 Terrence McNally has packed to the hilt his It’s Only a Play with hundreds of puns and pokes at the crazy, risky business of producing a play on Broadway, and he has done so with apparent twinkle in his eye and a throb of admiration in his heart. Just as those on his created stage, he over-does it a bit at times; the constant barrage of names dropped and corny lines can get a bit much after a while. However, in the hands of this New Conservatory director, cast, and creative team, It’s Only a Play is an evening to relish and enjoy and a means to forget all the bad things happening in that ugly world outside the hallowed, safe walls of the theatre. 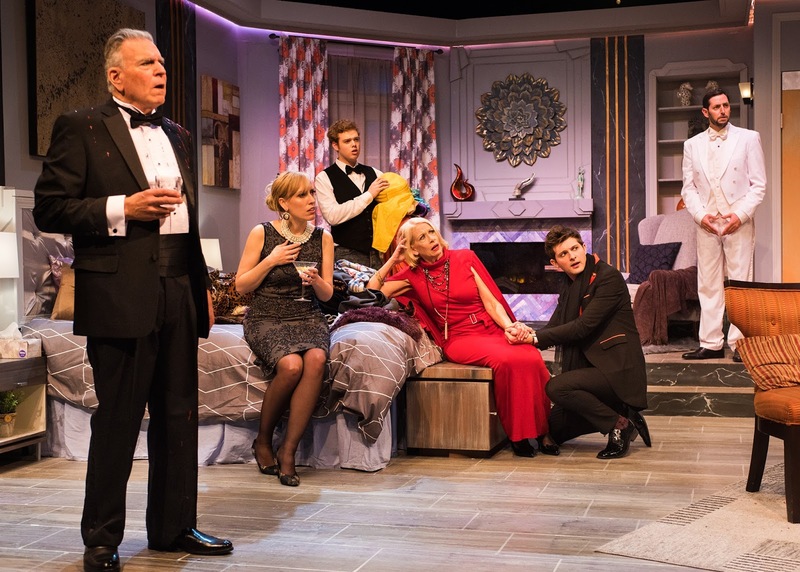 It’s Only a Play continues through April 1, 2018 on the Ed Decker Stage of the New Conservatory Theatre Center, 25 Van Ness Avenue at Market Street, San Francisco. Tickets are available online at http://www.nctcsf.org or by calling the box office at 415-861-8972.